Home Answering religious questions	Why do the Shia pray at three times while the Sunni pray at five times? 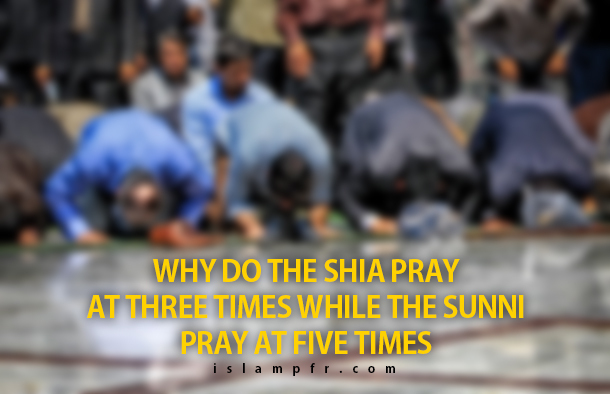 Why do the Shia pray at three times while the Sunni pray at five times? The reason the Shia perform their prayers at three times is the Quranic verses and traditions on the matter. Although the Quran has mentioned that prayer is obligatory several times and hasn’t gone into the details, it has spoken of its times: “Maintain the prayer from the sun’s decline till the darkness of the night, and [observe particularly] the dawn recital. Indeed the dawn recital is attended [by the angels of day and night]” (17:78). Therefore, the Quran has listed three times for the prayer, not five. 1-There is a hadith that discloses that the prophet (PBUH) prayed Zuhr and Asr together, as he did with Maghrib and Isha. He was asked about this and he answered: “I did so in order for my nation not to be under the burden of hardship.”. 2- It has also been narrated that the prophet prayed Zuhr and Asr, and Maghrib and Isha together, while not being fearful of anything (compelling him to do so) or travelling. 3- Imam Sadiq (as): “When the sun reaches its highest and begins to decline (zawal), it is time for Zuhr and Asr, the only thing is that Zuhr must be performed before Asr. You are then free to perform them any time you like until sunset. There are of course many other hadiths from the prophet (PBUH) and Sunni scholars on the permissibility of performing prayers together even when not travelling or when there is no danger. To wrap it up, we must say that clearly it is better to pray each prayer separately and at five times, nevertheless, in contrast with the Sunni viewpoint, such a thing isn’t obligatory. The reason behind why there is a difference of opinion between Shia and the Sunni schools of thought regarding this issue goes back to where each go to get their Islamic teachings and rulings; the Shia refer to the Ahlul-Bayt (the prophet’s household) who have said that the time for Zuhr and Asr extends from Zuhr time till sunset. Also, the generality of the verse: “اقم الصلاة لدلوک الشمس الی غسق اللیل ” is another reason for their claim. Of course, it shouldn’t be left unsaid that each prayer has a time in which performing it then is recommended and mustahabb, bearing great rewards. According to the traditions of the prophet and Imam (PBUH), it is mustahabb (recommended) to pray the daily prayers at five times, although performing them together (Zuhr and Asr together and Maghrib and Isha together) is also permissible. So it is permissible although separating them is mustahabb. Shia or Sunni, which one was in the Prophet’s time? Was Lady Fatimah (PBUH) content with Abu Bakr? Why the Quran is limited to Middle East?